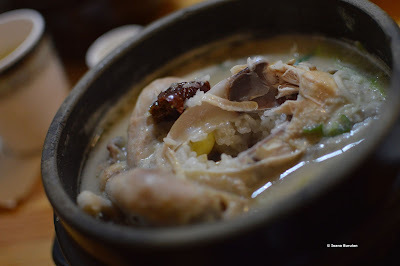 Few weeks ago I had the chance to taste the famous Korean Ginseng Chicken Soup otherwise known as Samgyetang (삼계탕). It’s prepared by boiling a whole young chicken that is stuffed with glutinous rice in a broth of Korean Ginseng. Other herbs and spices such as jujube fruits, gingko nuts, garlic, ginger, wolfberry and Danggui (or otherwise known as Angelic Sinensis) or other medicinal herbs may also be added. 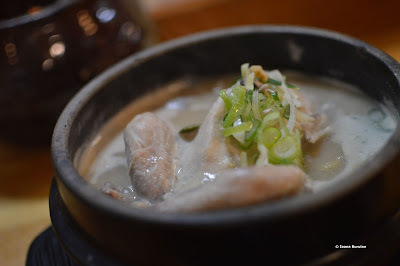 And not anywhere but in Seoul at Tosokchon restaurant which was also frequented by Late President Roh Moo-hyun. In one word, excellent!